Ask fellow campers about "Sky Ute Casino RV Park" and nearby attractions. Cement pull through with full hookups, fire place and picnic tables. Dog friendly with bag dispensers along the walking area. Short drive to Durango with anything you want. We camped at Sky Ute Casino RV Park in a Fifth Wheel. Durango is close and has anything you could want. We were originally planning on spending 4 days at Sky Ute Casino but extended it for 5 additional days. This is a really nice RV park. All of the interior roads and sites are on cement. The utilities (FHU) are on the driver's side. Every utility pedestal contains 20/30/50 amp service. The electrical voltage was strong - hovering around 125 volts. All sites had a picnic table and BBQ stand. The sites were relatively level and long enough to contain a very large RV. Next to the RV site is an area where you can park your vehicle. Surprisingly, the WiFi was strong. Verizon air card reception was spotty. Verizon cell phone reception was good. All of the street lights worked, even the lights on the electrical pedestal. 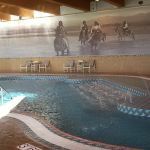 Being a guest at the RV park allows you to use the pool, hot tub and exercise equipment. Showers were also available. There are (4) washers @ $3.00 and (4) dryers @ $1.50 for 40 minutes Check in starts at 1 PM and is strictly enforced. The price reflects a Passport America discount. It was very quiet at night. We would come back to this campground. We travel with a 32 foot 5th wheel. We camped at Sky Ute Casino RV Park in a Fifth Wheel. This is a very nice camp ground located at the Sky Ute casino. The area is a desert but the casino grounds are maintained in lush condition. The sites are black top; the patio area is river rock. I rated the service bad because I arrived at 11:00 in the morning two hours before their 1:00 check out time. There were many sites available at the time, but they made me leave the facility even though I had reservations and come back at 1:00. When I got back at 1:00 they rushed me through the check-in process, because there were other campers waiting to get in. This is the only facility that has refused to check me in prior to their published check-in time when they had sites vacant. The rate here is very good for the four corners region. We camped at Sky Ute Casino RV Park in a Motorhome. Great little park at the Sky Ute Casino. Easy to get in and out of, good satellite hookup and Verizon signal. They take Passport America so our first 7 nights were $19.50 and the last two were $35.00. Easy trip into Durango. Amenities at the Casino are pretty good. We used the pool and the one of the restaurants and both were very nice. Very nice biking/walking trail along the river in Durango. Worth the drive. We camped at Sky Ute Casino RV Park in a Motorhome. We paid the Passport America rate of $19.50 plus 3% lodging tax for a 50 amp FHU site with very good WiFi. The site was paved with concrete liners and curbing. It was double wide at the rear for toad parking and had a nice concrete patio area with a picnic table. As mentioned it is a bit tight for toad parking, but better than a lot of other places. Overall a very well designed layout. We had pretty good OTA TV when we arrived on a weekend. But it was a bit more fuzzy on weekdays. Verizon cell and broadband were both very good. We camped at Sky Ute Casino RV Park in a Motorhome. The Casino is allows smoking and it was pretty bad on the weekend. We went in again during the week and it was not as bad. There is a sports bar inside just off the casino. BSB (Bottom Shelf Brewery) is a good bet for a brew and to eat. Take a left on 517, then right on 516 back to Bayfield. Greeted by the couple who were camp hosts. After parking, you had to go into the casino to check-in. Nice, helpful staff in the casino. They have a beautiful indoor spa and pool with large, clean showers. The sites in the RV park are long enough but narrow. Our site was oddly very unlevel as it dipped to the driver side and toward the back. The sites are concrete with a picnic table, trash can, and grill. There is a small place for the car on the side. Our friends had to park their truck in front of their 5th wheel because if they parked on the side they had trouble getting in and out of the RV. There are some trees with decent enough spacing between sites. There is some noise from 172 especially during the day. It is quiet at night except sometimes you hear the employees chatting as they walk to there cars during shift changes. WII FI is pretty decent although it slowed down considerably at times. Directv satellite coverage good. Verizon 4g 4bars but still iffy at times for some reason. Great Passport America rate which is good for seven days. It is about a 20 min drive to Durango. We camped at Sky Ute Casino RV Park in a Motorhome. Great bike trail in Durango - the Animus Trail. Also, the drive to Ouray on the Million Dollar highway is not to be missed. Other reviews of this nice small park are spot on. The value just can't be beat. We found the park easy to navigate with our 40' fifth wheel. The site was spacious, although with slides extended the parking area next to the RV was tight so we parked the tow vehicle in front of the RV instead...sites are plenty long. Nice patio area with picnic table and a small barbeque. Our only complaint was the laundry facility; it's very small with only two washers, both of which were out of order during our stay. We camped at Sky Ute Casino RV Park in a Fifth Wheel. A 30 minute drive into Durango for shopping and restaurants. We really enjoyed the Animas River Trail in Durango, and the beautiful drive up to Silverton & Ouray. What a place to stay!!! Great location and very, very clean. Level concrete pads. The park managers are great very friendly and helpful. About 15 miles outside of Durango. When in this area again will stay if a site is available. We camped at Sky Ute Casino RV Park in a Travel Trailer. Very nice restaurant in the casino. A little expensive but a good restaurant. The pool and work out room is is available for your use. We were here for about a month and were able to use our Passport America nightly rate for one week only - $18, but after that a weekly rate, thus when we averaged it out, it was about $30 a night. Still a very good rate for this area. The campground is small (24 sites), but ample size and a nice place to park your car beside your RV. Campground hosts are very pleasant and, of course, the casino is across the parking lot for other amenities. The one downside is the sewer connection had to drain uphill but we made it work. There is also a sewer dump at the end of the park if you would want to use that. This park is about 17 miles from Durango so depending on your needs, it is a bit of a drive to bigger shopping and things to do. There is a very nice small grocery story in Ignacio, several restaurants, etc. for daily needs. We would definitely stay here again. Love the beautiful views and quietness of the park. We camped at Sky Ute Casino RV Park in a Motorhome. When you arrive at the casino, follow the signs to the RV Park and see the host. She'll tell you what site you're in. Pull into the site. Be careful when you hook up your utilities. You'll be standing on stones and can twist your ankle. After you're set up, go into the casino to check in. They'll give you a parking pass and keys to access the laundry and the pool. The RV park is very nice and clean. You're parked on macadam and there's a cement patio with a picnic table. The pool is large and beautiful. There are 2 washers ($1.75) and 2 dryers ($1.50) in the laundry. That sounds reasonable, but the dryer only runs for 30 minutes so you sometimes have to run the load through a second time. Also, there is no place to park near the laundry, so you have to haul your laundry quite a distance. All in all, we enjoyed our time here and would stay here again if ever in this area. We camped at Sky Ute Casino RV Park in a Motorhome. This was an extremely nice park in a great location. The pool was the best ever. All the people we talked to said the same thing. The only improvement that could be made is to have cablevision of some kind and covers over the tables. The hostess was very friendly and helpful. We had to use the showers because ours is not handy. The showers were great with lots of hot water and adjustable in all ways. We camped at Sky Ute Casino RV Park in a Travel Trailer. We rode the Durango & Silverton train, went to Chimney Rock for the tour, went shopping and out to eat in Durango and drove to Silverton. All close enough for a nice drive. Recommend these fun things to do. This is such a nice rv park.....clean and well laid out. They allow you to use Passport America for up to 7 nights....what a deal! The sites are all concrete, with a nice parking spot for your tow vehicle, and a patio with table and grill. The camp hosts are super friendly and helpful, and get you into your spot in a jiffy. You pay for your stay inside the casino at the hotel registration desk. All utilities worked very well. This is a great location to stay in to see the sights in the area. We were told it fills up nightly, so reservations are a must. We will DEFINITELY stay here again when in the area. We camped at Sky Ute Casino RV Park in a Motorhome. Was here a year ago and same great park. Passport America rate is great. Power and water good. No tall trees to block satellite. Paved but not that level but works. Sites are short if you are long with a tow. The restrooms are in the casino if you need to use them. Have table and grill if needed. Will stay again if in the area. We camped at Sky Ute Casino RV Park in a Motorhome. Nice stop for a visit to Durango 30 minutes away. P/A and Good Sam discounts. 300 points on players card = free night camping. Durango has grown from a quaint wide spot to a small city with big box stores. Grocery's in Ignacio are a bit higher the Durango. Campers with pets are directed to the back row where there are woods & grass to walk them. Casino is an easy walk from the site - food was OK. Free Wifi worked well and the camp area is well lighted and quit at night. Warm days and cool night make for happy campers. We camped at Sky Ute Casino RV Park in a Fifth Wheel. Sit down restaurant for formal dinning and a small cafe inside. Food prices make up for the discount camping. Free good WiFi. No cable but reasonable reception on our antenna. Wide asphalt sites with table and BBQ. You have a concrete patio. 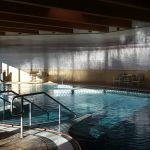 The casino is within walking distance; we did not use but also within walking distance an awesome inside swimming pool. Quiet at night. We loved the spot and sure be back. Just a 20 minute drive to Durango, Chimney Rock NM, 50 minute drive to Aztec Ruins NM. 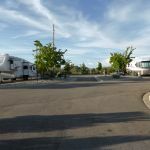 We camped at Sky Ute Casino RV Park in a Fifth Wheel. Southern Ute Museum, just a 5 minute walk down the road (or 2 minute drive). Very interesting and sure go there!. Chimney rock NM, just 30 minutes beautiful drive. Durango biking along the Animas River on the Animas River trail, 7 ml. one way easy and beautiful concrete path right into town. Your can park your vehicle near the Home Depot. Aztec Ruins NM, in New Mexico is a one hour drive and worth while. All the big shops are in and around Durango, Walmart, Home Depot. Bicycling trail along the river in Durango, casino pool is really nice. Grounds good to walk around, lots of artwork and sculpture at Casino. Check out entertainment at the attached Event Center. We saw Travis Tritt. Also research things happening in Durango. Bluegrass Festival was on in April. Durango 2o miles away . We had taken the railroad to Silverton before so we drove it this time so we could stop along the way to enjoy the colorful scenery at this time of year. Tajectge Durango to Silverton narrow gauge Railroad, of drive there. Beautiful views either way. All sites were pull-through. This RV park is part of the Ute Indian casino Sky Ute Casino. Casino is typical of most modern moderate sized casinos. If you need a chiropractor while here, Dr Garcia is wonderful and about 5 minutes from campground - his prices are very reasonable too. The grocery store in town is great, no need to run into Durango. Also if you want a great lunch, try KD's Cafe right beside the grocery store...the owners are so friendly. This little town has a lot to offer. The ride to Silverton, both on train & drive, is beautiful. If you want a fantastic meal in Durango, try Ken & Sue's. Thirty minutes from Durango. It is a great town for walking, shopping, and bar hopping. The Durango-Silverton scenic railroad is a great tour. Suggest taking the train to Silverton and the bus back. This park is about an hour from Mesa Verde National Park to the west and Pagosa Springs to the east. Durango, CO, Sky Ute Indian Reservation, Ignacio, CO, San Juan Mtns. Are you affiliated with Sky Ute Casino RV Park ?